We have two churches functioning in Macau. Two UB Global staff work with those churches while also ministering to youth and adults in the community through English classes and conversation. Hong Kong and the United States share oversight of Macau. The work in Macau began in 1987 as a partnership between Hong Kong and UB Global. UB Global provided two couples, and Hong Kong provided a Chinese coworker. Church planting, using contacts made through teaching. For most of its history, Macau was a Portuguese territory, just as Hong Kong was a British territory. Both Macau and Hong Kong consisted of a peninsula off of the Chinese mainland, plus islands. Great Britain returned Hong Kong ownership to China in 1997, and Portugal followed in 1999 by transferring control of Macau to China. Macau is home to the world’s most lucrative gambling industry, surpassing Las Vegas. This presents both challenges and opportunities. 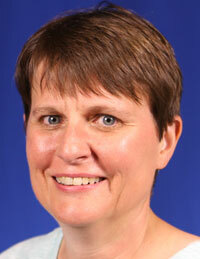 Jennifer Blandin is the Macau Mission Director. Macau, with 624,000 people packed into just 12 square miles, is the most densely populated place on earth. It is also the world’s gambling capital. 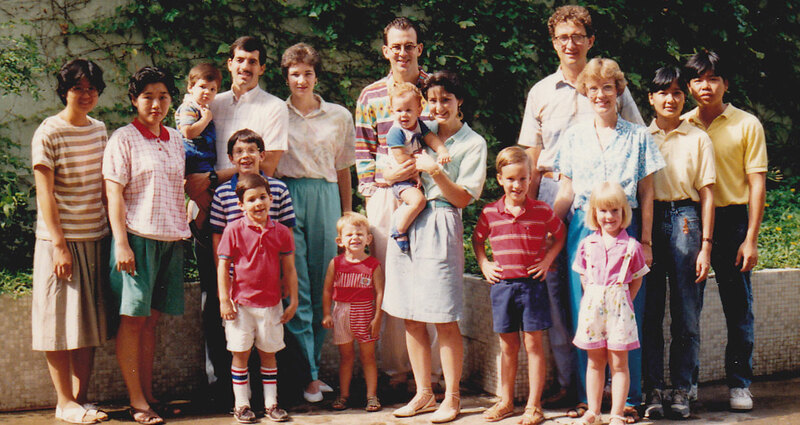 The Fetters, Burkett, and Sherlock families with their Chinese coworkers, around 1990. In the late 1980s, Hong Kong Conference had a vision for Macau, a densely-packed city occupying a peninsula west of Hong Kong along the Chinese coast. Macau was largely unreached with the Gospel. They approached Global Ministries about partnering to start a ministry in Macau. The United States provided two ministerial families—Luke and Audrey Fetters and family, and Phil and Darlene Burkett and family–along with funding. Hong Kong provided a Chinese co-worker named Carol Chan, and additional help. This team began working in 1987. Everything started with the English Language Program, which was an immediate success, as scores of local people signed up to learn conversational English. Relationships formed through the ELP led to the start of a church named Living Water. Karis Vong became pastor of Living Water Church in 1992. She is a native of Macau who became a Christian through the witness of a sister who had become a Christian. Karis attended Macau Bible Institute, and while there did an internship at Living Water Church. During that internship, she met her future husband, Lawrence, who worked in a bank. They were married in September 1995–the first wedding at Living Water Church. A second church, Living Word, began in 1993 as the United Brethren Youth Center. It was intended to give students a quiet place to study and receive help from tutors, with the hope that it would eventually turn into a church. University students from Living Water Church organized a daily three-hour tutoring program for kids whose parents didn’t have time to spend with them after school working on their homework. The UB Global staff also began teaching English classes there. In 1995, on Easter, they began holding church services at Living Word. The English Language Program at Living Water Church ended in December 2000. In early 2001, a facility on Taipa Island, a fast-developing island separated from the main part of the city by a causeway, was dedicated. In March, a new English Language Program began at that location with about 70 students. The Living Word church relocated in 2002, but closed a few years later. However, a new church began on Taipa in 2006. It was called Living Stone. In addition to the two founding couples, about 20 other UB Global staff have served in Macau over the years—most of them full-support staff, but a few short-term and volunteer staff. Macau is located 37 miles southwest of Hong Kong. It consists of the Macau Peninsula, plus the islands of Taipa and Coloane. The city is the most densely populated region in the world, with 18,400 people per square kilometer. Portuguese traders established a settlement in Macau in the 1500s. The name “Macau” is thought to come from the name of a temple built in 1448 for Matsu, the goddesses of seafarers and fisherman. 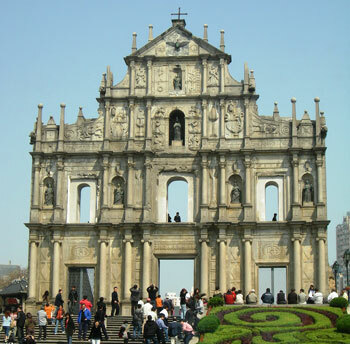 This edifice of a Catholic church is Macau’s most famous historical landmark. In 1535, Portuguese traders gained permission to anchor ships in Macau’s harbor and to conduct trade—but they couldn’t live on shore. Around 1552, they were allowed to build storage sheds, and stone houses soon followed. The Portuguese established a permanent settlement in 1557. However, they remained under Chinese sovereignty. Portugal occupied Macau in 1842 after the First Opium War. China ceded the area to Portugal in 1887. The Chief Executive is the top administrative leader in Macau. He is chosen the same way the Chief Executive is chosen in Hong Kong: a local committee of several hundred business and community leaders elects the person, and the Chinese government officially appoints him. Tourism, especially gambling, is a huge part of the economy. The clothing industry accounts for 75% of exports. About 25% of the workforce comes from outside Macau. Over 30 million visitors come to Macau each year—half from mainland China, and 30% from Hong Kong. Most of the population growth comes from immigrants from mainland China; about 47% of residents were born in China, while 42% were actually born in Macau.